This is me in the kitchen at the Sunfired Culinary Institute in Panama. I love to roll up my sleeves and let get in flow with my creativity. 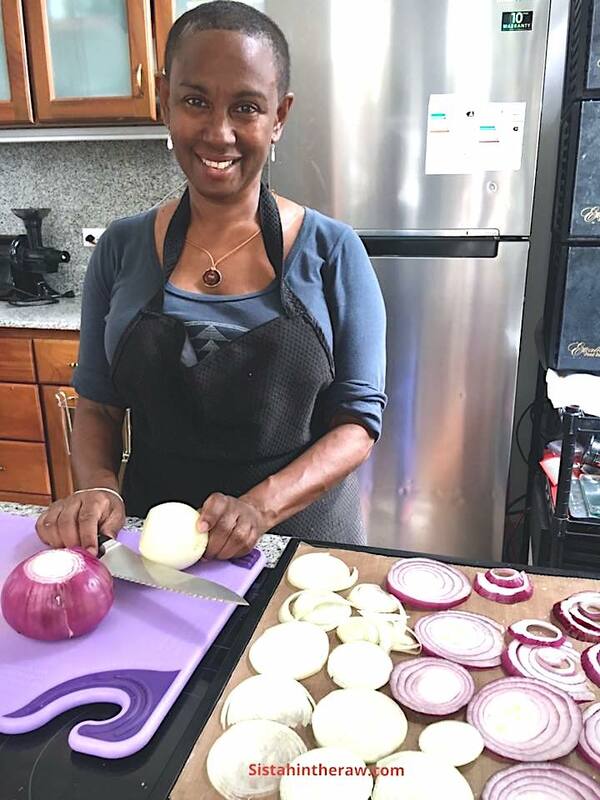 Here, I'm slicing onions that went into the dehydrators behind me, for which I needed a suitable sharp knife...most people who know me, know that I'm a bit shy of sharp knives, even though I did do some knife skills training in London some years ago. This brings me to where I want to share some thoughts about how to go about setting up your raw food kitchen. A well stocked living foods and raw plant-based kitchen is your affirmation that you truly understand this lifestyle choice. Your commitment is reflected in your choice of organic products, your shopping habits and kitchen equipment chosen. More than food, this is an holistic health lifestyle choice, which recognises your connection to and inter-dependance with others and nature, it concerns all your choices, attitudes and behaviour. This is the lifestyle that restores harmony to the mind, spirit and body. When you think about creating your raw food kitchen, there are some simple guidelines that will help you to create a space that is hassle-free, where your culinary creativity can flow in a space conducive to preparation of health promoting meals. Clean, plant-based raw food means eating foods in their most natural, whole state, so as to maximise their nutritional benefits, let this be your guide. You choose food preparation techniques and equipment that enables you to stick closely to this principle. The first step to setting up your raw food kitchen is to take a look at the type of food you buy, is it healthy, sustainable, whole and clean, or mostly some type of processed foods? Simply, you can start to phase out anything that doesn't fit the 'healthy, sustainable, whole and clean' format. Look through you pantry and dispose of all unhealthy culprits, including seasonings and sauces that contain preservatives, oils that are not cold-pressed, cartons and tinned food. Look for healthy alternatives, which also means learning how to read food labels. When shopping for fresh produce, focus on reducing your exposure to pesticides and buy organic, or grow your own. You can visit farmers markets, or use a fresh food delivery service. If possible choose the freshest, ripest locally grown, vibrant looking food and food that is in season in your location. Firstly, making a shopping list and stock your cupboard with ingredients that you already like and use regularly, then add small quantities first of new ingredients over time to test them. Think packaged dried goods (nuts, seeds, grains etc. ), cold pressed oils, salt substitutes (like dried seaweeds or celery powder), herbs and spices, then add fresh vegetables and fruit, which require more frequent shopping trips. Wash and dry fresh produce and store them in their whole form in bags or containers that are not tightly sealed, in the refrigerator to allow them to breathe and to maximise freshness. Keep fruits that emit ethylene gas (apples, apricots, cantaloupe, honeydew, figs, avocados, unripe bananas, nectarines, plums, pears, tomatoes, peaches) separate from all other produce. Use up your most perishable produce first. Avoid cashews and peanuts. Cashews most often they are not truly raw and the nut is encased in toxic resins, while peanuts are commonly contaminated with moulds. Rinse sprouts and put nuts and seeds to soak in the morning while you are preparing your fruit or making a fruit smoothie. It isn't really necessary to have lots of kitchen gadgets, but they do allow for faster and easier preparation time. I have to admit, I do love testing out new gadgets, so over the years in my raw food kitchen, I have acquired an array of gorgeous food prep play things. The type of equipment you choose, will depend upon the type of raw food recipes you intend to prepare, so you can acquire kitchen equipment as and when it's needed. Start off with some main pieces of equipment to make preparation in the kitchen easier. A masticating juicer for superior juices that retain more of their nutrients and enzymes; a blender that can deal with the thick nature of many raw food dishes and frequency of usage; food processor with lots of attachments, great for chopping; a dehydrator with a thermostat for making pie crusts, patties, fruit leathers etc; and utensils and knives that you feel comfortable using. You might also want to consider a mandolin which slices, juliennes and shreds vegetables quickly, decoratively and with so much ease. A spice grinder which is also known as a coffee grinder, these tools double as a great way to grind up fresh spices or small amounts of seeds or nuts. They can also ground flax seeds. Think about how to design your space that that when you're preparing a recipe, your process can flow easily from one piece if equipment to another, so where they are stored and located is important. Store your seeds in a cool, dark place, preferably in glass containers. However, all seeds vary in their shelf life, and storing your seeds in the refrigerator will also double their approx shelf life. Nuts and seeds that are high in fats and protein can oxidise and become rancid over time, so store them in a freezer and ensure that they remain dry. Generally, it's best to use dried herbs and spices within a year of purchase. Ideally buy whole spices and ground them yourself. Avoid plastic containers, glass is great for storage of dry goods and prepared foods. Glass jars come in most handy for fermenting foods. Raw kimchi, nut cheeses, sauerkraut and other pro-biotic raw foods are fermented and stored using glass or ceramic jars only. Glass bottles and jugs are best for your raw hut and seed milks, flavoured water and other drinks. "Sprouting really does not require a lot of space. You can grow five pounds of food in the form of sprouts in one square foot of kitchen countertop space. This takes care of all the beans, legumes, and leafy sprouts. Using a tiered rack such as the seven-tiered Hydrosol rack, you can grow all the wheatgrass, sunflower, buckwheat and pea shoot sprouts you need for two people in two square feet of floor space. You can have a nice butcher block cutting board cut to size to fit over your stovetop and use that area for growing sprouts." There is so much more readily available information about how to get started with raw and living plant-based food and it's accompanying lifestyle, that it's easy to yourself clued up, which will enable you to make more informed decisions. There is a great deal of conflicting information flying around, even raw food fads and fashion that encourage unhealthy habits; so pick from the best tried and tested sources. You only need to start reading, signing up for Sistahintheraw programmes or attending a local class as steps towards optimum health and wellness. See the list below to get on track.